This simple beveled mirror is framed by dark, espresso finished wood. Slight changes in the angles allow for an interesting design element without taking away from the simplicity of this collection. Pair this piece with the dresser for an unparalleled combination. The Rolwing Beveled Mirror with Wood Frame by Coaster at Del Sol Furniture in the Phoenix, Glendale, Tempe, Scottsdale, Avondale, Peoria, Goodyear, Litchfield, Arizona area. Product availability may vary. Contact us for the most current availability on this product. Finish & Paint Options Two tone reddish oak and espresso finish. Frame Description Simple wood frame with slight diagonal cuts toward center. 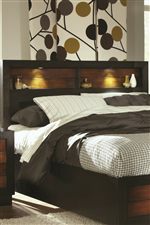 The Rolwing bedroom collection is one that shows off casual, simple design. Features like knob free drawers throughout allow the warmth of the two tone finish to be a focal point. Ample storage space is important for every master bedroom and this collection delivers storage and organization with each of its pieces. The center of interest is the built in storage provided in the headboard which is highlighted by tranquil lighting. All the pieces come together to show off a casual, but fashionable style. This collection helps create a space of pure relaxation and comfort. The Rolwing collection is a great option if you are looking for Casual furniture in the Phoenix, Glendale, Tempe, Scottsdale, Avondale, Peoria, Goodyear, Litchfield, Arizona area. Browse other items in the Rolwing collection from Del Sol Furniture in the Phoenix, Glendale, Tempe, Scottsdale, Avondale, Peoria, Goodyear, Litchfield, Arizona area.